I have the Ultegra 6870 groupset. In the rear derailleur trim adjustment, there are 33 positions, instead of 31. They go from -16 to 16. I have a Zipp 202 Firecrest wheelset with a Shimano Ultegra 11-28 11-speed cassette. When the Di2 is in the RD trim adjustment mode, the point in which the RD makes a slight clicking noise when it moves inward near the 4th sprocket is the 14th position, which meant i can only move the RD outside by only two steps, instead of the recommended four. Have you ever experienced this? Is it possible that the RD cage is bent inward? I’ve had this same situation when the rear derailleur hanger was out of alignment. Get a Rd hanger alignment tool and realign it. Hangers have to fit to the frame very accurately, thous out at the hanger will knock any RD out. Paint on the frame should be careful scratched off to achieve a metal to metal contact. On my Trek Madone 5.2 I run a shimano ultegra 6770 10 speed group. When I try to adjust my rearderailler and set the chain to the biggest sprocket and the big chainwheel in front the cheen jumps automaticaly to the smaal chainring in the front. I tried adjusting both deraillers but that does not seem to help. Does somebody know what could’t be the problem. HI, I have just purchased a second hand bike with Dura ace DI2. On my first ride when moving into the lowest gear the crank would manage a couple of revolutions before the chain jumped down up a gear? I have tried tuning the set-up and it runs up and down the cassette fine until when in lowest gear it seems to have a mind of its own and wants to jump gear? there is a section labeled ST / SW. I was curious what this stands for. Hi. I recently bought a Giant Propel Advanced bike with Ultergra di2. Everything was perfect for the first 300 miles or so. I was amazed at the pure silence and smoothness of the ride with perfect shifting. However recently a really annoying clicking noise has developed. I have narrowed this down so that it only occurs when in the big chain ring and cogs 2-6 on the rear cassette. As it is my good bike I initially left it with Chain reaction cycles for them to take a look. They said they made marginal adjustment to the hanger, ran it through the computer software, greased the pedals and made a slight index adjustment to the high and low screws. I was in a rush upon collection and didn’t try until I got home. Same issue is there only not quite as noisy. 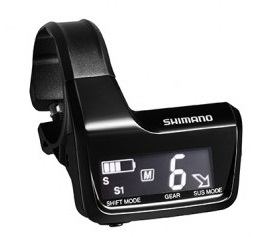 I’ve since followed the shimano di2 manual and indexed the gears exactly as stated i.e. put in 5th cog on cassetter and manually adjust derailleur until it starts to rub on the 4th cog then click 4 times to move it closer to the 5th cog etc. I’ve also perfected the high and low screws for both front and back derailleurs but I’ve still got the same problem. Thanks for responding Malcom. The bike is brand new. 350 miles so far. Has only been out on dry days with the odd occasional light rain shower. 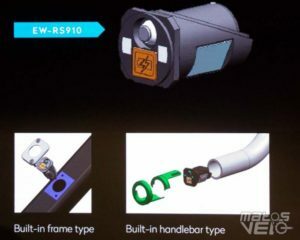 The bottom bracket should still be in great working order in my opinion. The chain reaction guy said he had the cranks off to look at the bottom bracket and said it looked fine. Although whether he did or not is up for debate! 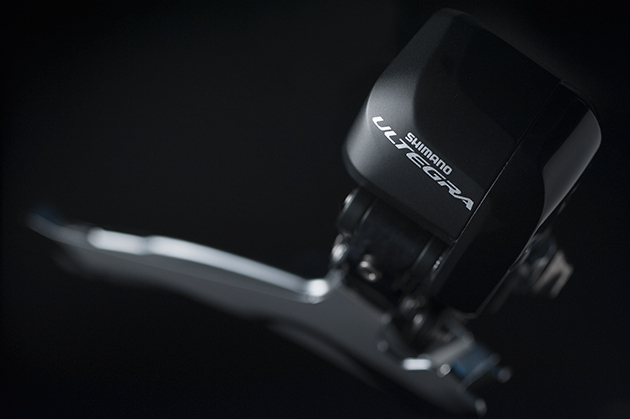 If your Ultegra is set up correctly it should be silky smooth and whisper quiet. If it is not the chainline, you are in the right place to get great advice. Carlton and the guys here will help, doubtless. We will assume your chain is good. Without viewing the bike it sounds like a simple indexing issue. 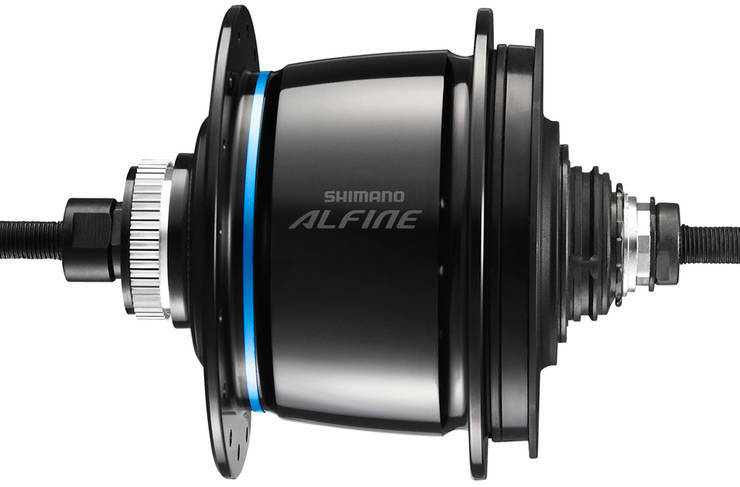 Shimano’s guidance on indexing is not sacrosanct. Indexing is an ‘art’. Taking an Occam’s Razor approach, carefully re-index. Examples are not uncommon where double indexing solves issues. Viz., index in the 5th ring and then index in the 2nd ring [large not small cog]. Index to silence so that there is no ‘clicking’ or friction noise [assuming your chain is lubed and good]. Return to the 5th to check you are still without issues and quiet. Some guys like oily chains but I am a minimalist in this area. It is not necessary to lube the outer plates of your chain. That should be cleaned off completely, unless you love gunk. The INNERS of the rollers/pins are the only areas you need to lube. Completely clean the excess off and you should be good to go. Keep going, you will resolve this in due course. It is odd the you are getting feedback and yet you cannot see any contact when viewing the bike in your stand. The guys here are a fountain of knowledge and will help you, gladly. What size is your cassette? Are you running a short or medium cage? Does the ‘clicking’ appear only under load? What wheelset are you running? 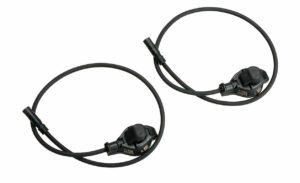 Have you checked the rear mech hanger? I can recall a job we had in [not chainlink] and the ‘noise’ was a spoke issue on a zip 303 on an Evo Di2 frameset! It took some time to isolate it and when riding the sound was difficult to isolate. Eventually we nailed it. It is doubtful that your local bike shop will give the attention to your bike that you would yourself. My advice is that you persevere here. The ‘brains’ here will help you isolate the issue in due course. Save your money. My cassette is 11speed 11-28t. I’ve no idea whether my cage is short or medium sorry. I’m reasonably new to bikes in general. How can I tell or do I need to check bike spec on seller’s site? The clicking appears on the stand and not just under load when I’m on the bike. There is no visible sign of any rub on the front derailleur. This suggests to me that it must be rubbing slightly on the rear cassette or jockey wheels. I must have a closer look later. I’ve followed the indexing instructions from the shimano dealership manual i.e. start in 5th cog and adjust until slight rubbing on 4th cog, then click gear lever 4 times to bring back towards 5th cog. Maybe I have to experiment with more click adjustments towards the 5th cog?? My wheels are the standard giant SL1 Aero wheel system that came with the propel advanced 0 2016 model. 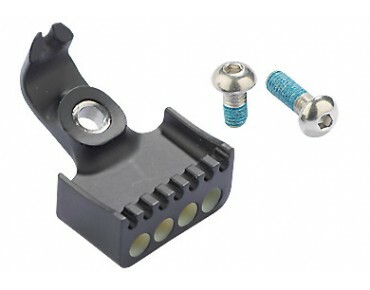 My bike shop told me over the phone that they made a minor adjustment to the rear mech hanger but I don’t own an alignment tool so I can’t verify. I apologise if I’ve not quite explained this using the correct terminology but I’m new to all this :). When my di2 was working well I was extremely impressed with it. Hi, I wonder if it’s possible to tune the FD to require a 2 second push to change – especially from the small ring to the large? Sometimes in the heat of a hard climb the FD will go onto the big ring inadvertently, only a touch moving from the climbers position to the levers sometimes does this. Hi David. 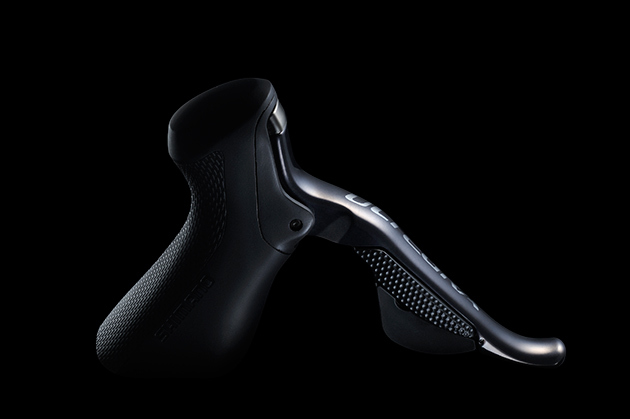 The Di2 levers do not allow for a 2 second push. You can adjust the ‘speed’ of the RD shifting but programming a 2 second delay to the levers cannot be done currently. 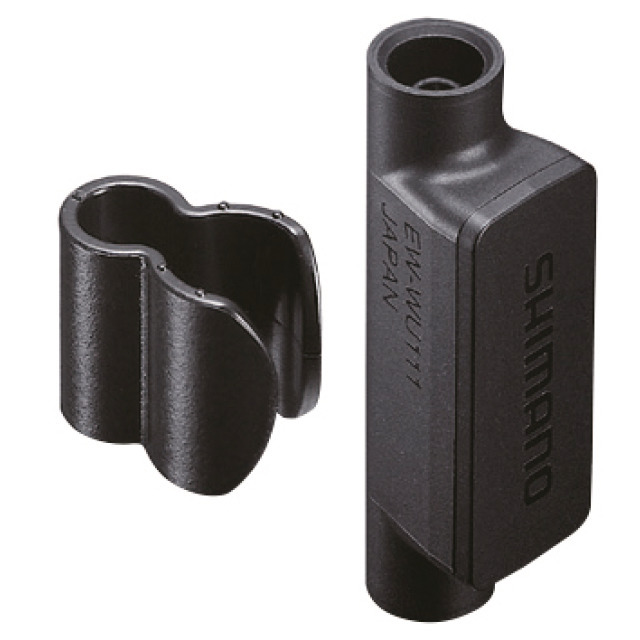 However, you may wish to do some maintenance on your lever assembly [ http://si.shimano.com/php/download.php?file=pdf/dm/DM-DA0001-08-ENG.pdf ]. It is possible to adjust the springs on the buttons. But be careful. If your levers have seen heavy use this may help. It is also possible [theoretically] to install heavier springs using a third-party producer. This will void your warranty and may create more problems than it solves. 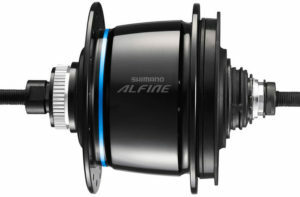 Shimano, as far as I know do not offer heavier springs. The issue looks like a ‘user problem’. Love this site and thread….question…I have 6770 fd and rd with ext. 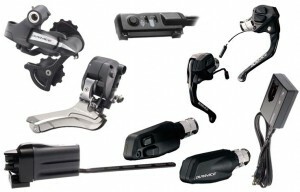 batt…I upgraded to 11spd shifters and got the PAVE climbing shifter….plugged into the right shifter and the climbing shifter doesn’t respond…..isn’t it supposed to?….my junction A is the standard with built in wiring…I have a 3 port but not yet installed….thanks to all contributions in advance. 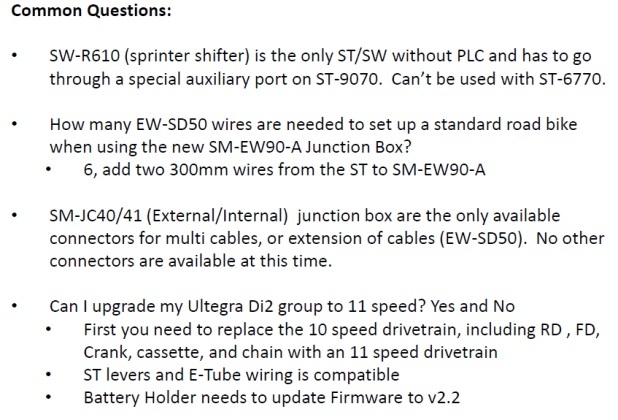 Assuming your shifters are new/okay and you are using the SM-EW67-A-E Ultegra 3-Cable Junction, simply update all the firmware on all your components and it should all ‘talk’ and work fine. If you are running the SM-EW67-A-E Ultegra 3-Cable Junction you do not need the SM-EW90-A 3-port. I have a st7970 that was working fine but not anymore. 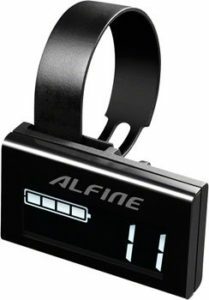 Its jumps gears, lose adjustment and many other things… I noticed that problems are in phase with a possible error message on the leds. Both leds flash 5 times in red. Someone knows the meaning of that flashing? Your rear derailleur has failed. I have a 7970 that used to be working fine. It now skips gears and is impossible to adjust. I adjust it and it changes the adjustment itself a few second after I exit the adjustment mode. When it does that, it also flashes the 2 leds in red five times. Do you know the meaning of the 5 red flashes? This also occurs when I am shifting gears and even during recovery mode. 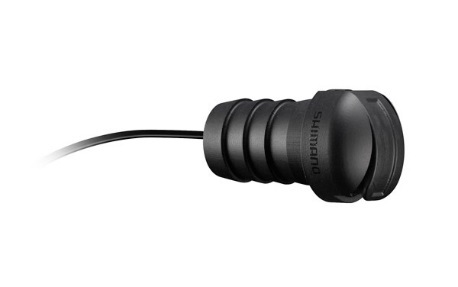 I would also get the same 5 flashes when I reconnect the 5 wire cable to the junction A. As I said in my previous reply, these are all symptoms that the servos are about to fail. However this time you gave more information, and if you can get it to go into recovery mode indicates it is possible that junction A is at fault. But typically the symptoms indicate the RD has failed. Thanks Di2diy. I was looking on the web to find that RD… it seems to be backorder everywhere. Do you know where I can find one? How can I make sure that it is not the junction box A? Any test to suggest? Not too many offers on Ebay these days for 7970 beside buying the full kit $$$. Before buying a potential fix, I decided to do some tests. I reversed engineer the signal going to the RD. Since I did not have a special tap connector, I could only look at the actual signals in open loop (RD wire disconnected) on the wire going to the RD using an oscilloscope. First, I found that shift up and down are multiplex on the same wire. A shift down would generate a positive 100 msec clean 8 volt pulse (vary between 50 msec to 500 msec depending on how long you hold the shifter). On the same wire, a shift up would generate a serie of 2 msec pulses that would last the same time of a shift down pulse. Therefore, the RD has enough intelligence to discriminate between the 2 types of pulses. When you hold the button on junction A, a 140 msec pulse is generated. But since my RD wire was disconnected, the RD would not go in adjust mode. I kept looking at my shift up and down pluses and after a while I started to see “defectives” pulses. There is a good chance that those defective pluses are the cause of my problem. Since the RD wire is not connected when it happen, the problem is most likely in the junction box A. So, I will try to get a new junction box A… but I might also open mine to see if I could find something wrong inside. Good work on troubleshooting the problem. I would agree it’s likely the junction. The symptoms you described are all consistent with the RD failure, except you said you could get it in recovery mode, which is not consistent with RD failure, but points to the junction. Ebay you could get a used one for cheep. If you have trouble let me know I think I have one sitting around I could sell. Hi Ghislain, there is any chance to speak with you? I’m working on a “home made” di2, buying only the rear derailler. I’m using a microcontroller to do the PWM modulation but I don’t have any Di2 groupset so I can’t test it properly and I would like to know the differents signals for the different functions. Hi, I am trying to do the same. My own “control unit” giving orders to Shimano DI2 rear derailleur. Could we get in touch to discuss the Signal going to rear derailleur? Thank you so much! Thanks for the offer Di2Diy, I got a new one on ebay today. I figured that 65$ was an acceptable price. While waiting to get my junction box A, I did some more tests. 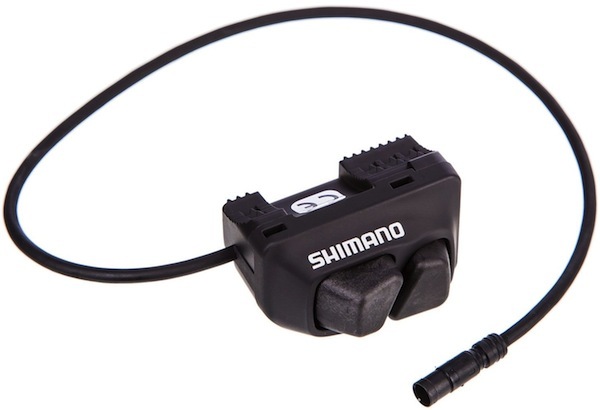 In fact I managed to probe the signal live when the wires were connected to the rear derailleur. That way I proved that the ghost shifting were not triggered by any signal on the usual shift up or down wire. In fact, it was obvious that ghost shifting was triggered by the activity on the fourth wire (other than power, ground and shift). That forth wire is a communication wire and this is where you find the 140 msec pulse when you turn on the adjustment mode. When the derailleur does not behave as expected, you can see a lot a communication between the derailleur and the junction A. Somehow, the derailleur is telling junction A that it was not able to perform the expected shift up and down and junction A gives it other wired recovery instructions. So after that test I was pretty sure that the new junction A would not fix my issue… and it did not. I bought a new derailleur on ebay that I got last night. I installed it and it works perfectly. Therefore, when we get the error message where the 2 red lights flashe 5 times, the solution is to replace the rear derailleur. I still have some hope to repair the faulty derailleur but before opening it I will try to see if there is any way to have it replace by Shimano… after all, it is only a few months outside of the warranty… I am working with a local store for this. I suggested the junction was in error because I thought you said that you could get the RD to go in recovery. Also the cost of a RD is worth the chance. I do not have a scope to do the diagnostic you did. Your original symptoms did suggest it was the RD. Cheers. Yes, it could go in recovery mode but sometime it would be partial… not going thought all the gears. As you say, junction A was cheap and can be resold on ebay anyway. I downloaded and installed the v 2.11.1 update and now I get an E-Tube Project has stopped working error every time I try to open the app. I have Windows 10 installed. The device manager also says the driver for the SM-BCR2 is missing. Everything worked fine before the update was installed. I have the same issue with v3.2.2. No devices attached, just installed the software. Problem: After 19 hours on SM-BCR2 charger the charging LED continues blinking once every 3 seconds. When either of 2 FD switches is depressed, the red LED on SM-EW90-A junction box blinks 5 times. -FD got stuck on small ring and stopped shifting during normal ride. RD remained fully functional. Shimano 6770 manual diagnosed low battery charge. -Charge-error light on charger remains OFF. -Bike is a Specialized Roubaix, purchased end of 2015; accumulated 300 miles. -Never ridden in rain, always safely garaged and never dropped. That charger runs on USB power. It needs a USB source that’s greater than 1 amp. Make sure your USB transformer meets that spec. Many do not. This assumes all firmware is up to date. Note that most laptop USB ports meet the 1 amp spec. Worrisome blinking LED is a steady, yellow glow now. Knew there was hope for the wicked. 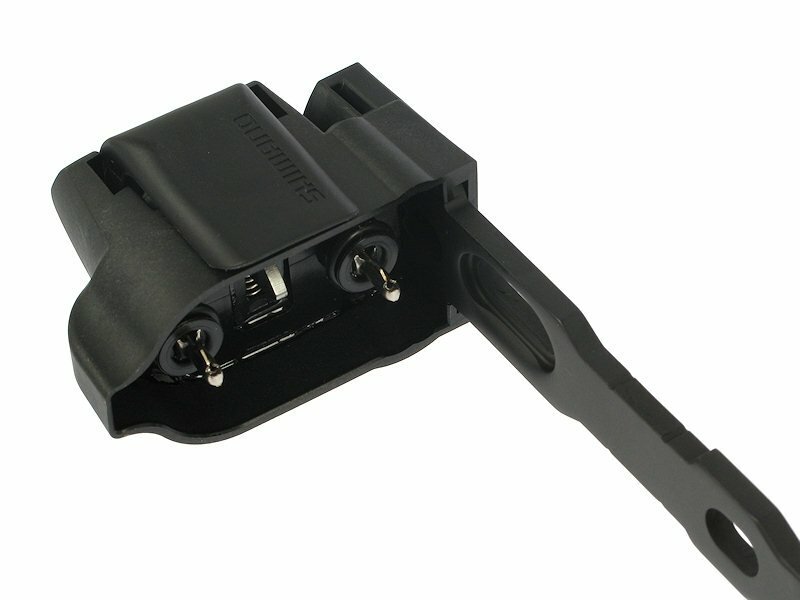 Is there any update on allowing USB charger to charge external battery? Article seems to imply it is only external charger. Bike shop thought USB did but when tried at home it wouldn’t charge. 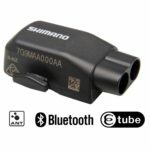 I had to go external battery on a new Di2 compatible frame as the frame is sealed internally preventing wire running to an internal battery – thanks Bianchi! Other than drilling a hole (and voiding my warranty) now have latest external mount and Ultegra junction box. USB is a pref so can do firmware updates as well. I’m having a really weird issue with my di2. When I go for a ride, after 10 minutes it stops working. I hold the shifter button to see if the junction box light goes green but nothing at all. I also hold the recovery mode button for 5 seconds but nothing. At the begining I thought it was just that the battery was drained. But when I put it to charge I could see that the battery was fully charged already! The funny thing is that after plugging unplugging the charging cable everything worked fine again. 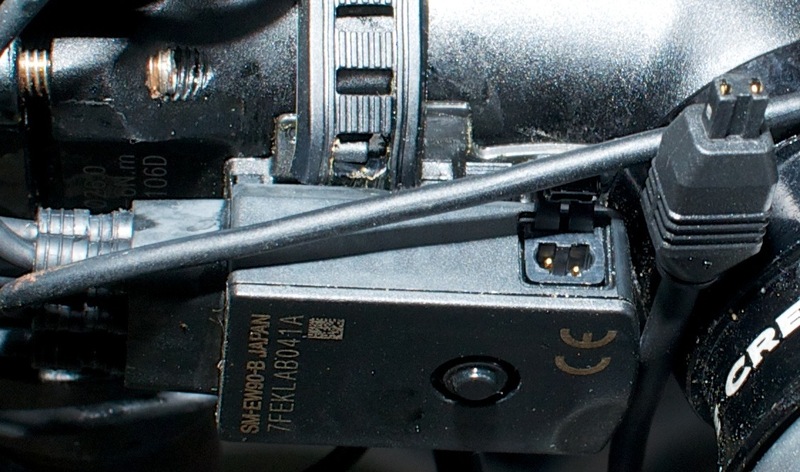 Holding the shifter button showed the green light in the junction box for 2 seconds (battery 100% charged). So I went again for a ride and after 10 mins…. same thing, di2 stops working. I took it to my LBS and ran the diagnostic tool. No issues found, they just found that the internal battery was not seating correctly. We thought that could ve the issue. But again same issue whenever I go for a ride. No idea of what to do! Could be the junction box? Battery? Any loose cables? My LBS checked all of that. What should I do now? Perhaps someone has experienced the same issue. I had also problems with my Di2. Check all cables if there is no break in a cable. My system had a break in the cable running from left shifter to the junctionbox. Hello. I have an older full Dura-Ace (7970) road kit and my rear derailleur just stop working and is not fixable. I have been trying to get just the derailleur but they are not longer available, they come once in a while in Ebay but there is none now. As Carlton has already pointed out, you could possibly wait for one to come up on ebay, which they do, but you could be waiting a long time. 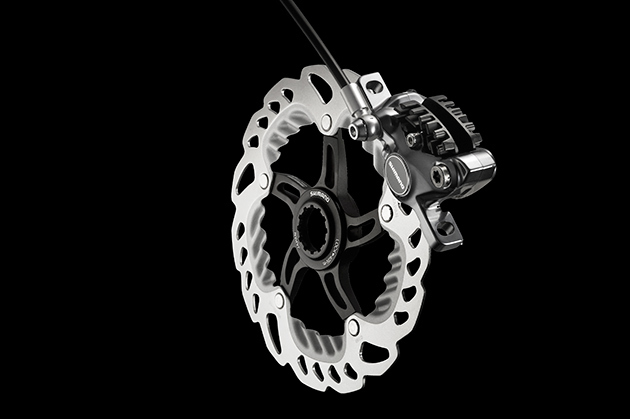 You don’t necessarily need to change your 10 speed crankset at the moment as this will work more than satisfactorily with an 11 speed chain/system. You can stop worrying then for the moment about anything failing as the parts for the 6870 group will be available for many years to come. 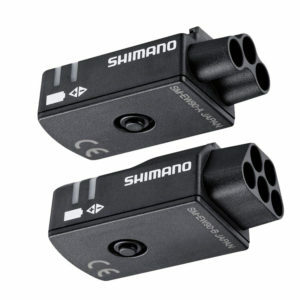 (until 12 speed incompatible sets ease their way in!). 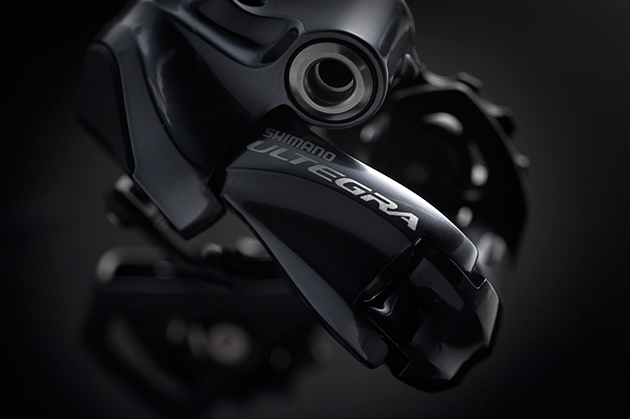 The difference between Ultegra and Dura Ace is not that great and certainly not worth the mega price difference. Best of luck whichever way you go! 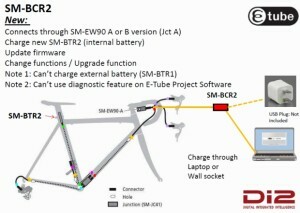 Re my last post, sorry, this was the link to the Di2 install I was talking about. 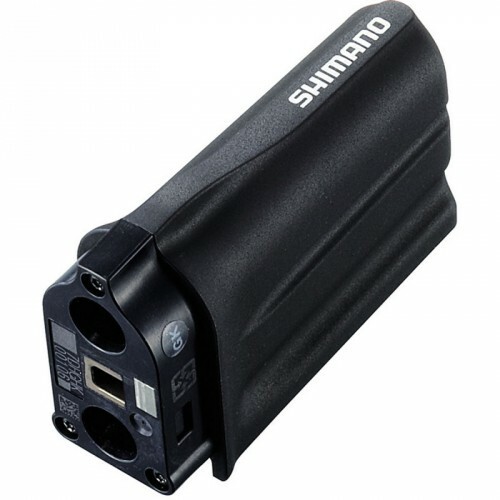 I’m building a test platform that is goin to use the gear shifting system shimano DI2 6870 but we want to replace the battery by a voltage source. So we are wondering if you know the input voltage required for the external mount of the SM-SMBTR1 battery or battery pinout polarity. It is about 9V (near full charge) and negative is closest to the mount side that the battery slots on. I have just worked out a hack to downgrade software using the E-tube software. Let me know if you want more info on how to do this. Perhaps it would be useful to add it to this page. Of course someone probably has worked it out before, so it may be that this is nothing new. I did this using etube 2.11.0 but it probably works with the latest. I just installed 2.2.3 off the etube site (for older OS) and got the old firmware files from it tricked the newer etube into thinking they were newer files than installed on my bike. In my case I used it to downgrade an internal battery and shifters to enable me to use an internal battery with the EW67 junction. Bike working great! @Vosadrain – I didn’t know downgrades were possible. Yes, please share the details. I assumed there was a certain level of file validation through headers or checksums. It sounds like that’s not the case and that it’s at the file name level. Thanks for sharing the info. 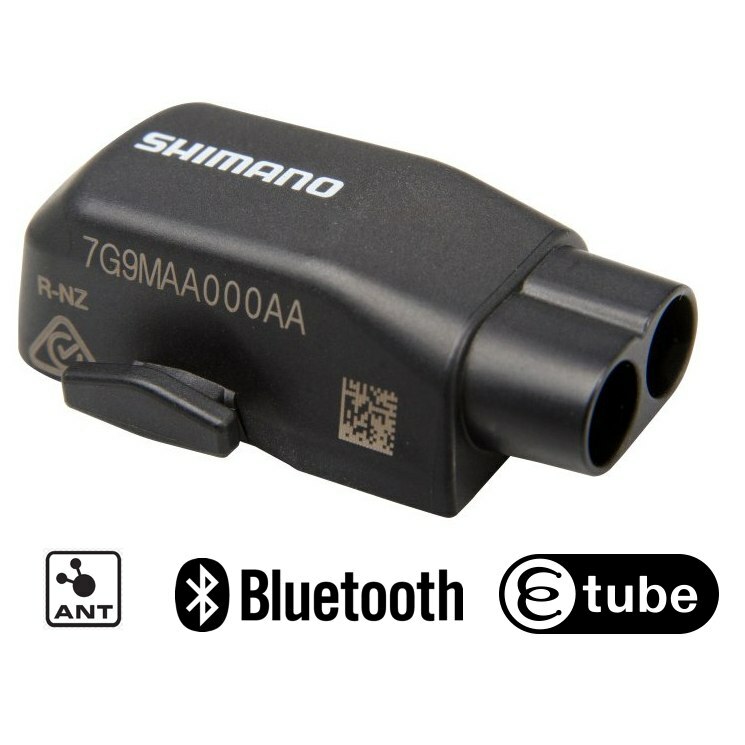 Shimano have done little to prevent you hacking it. I am no hacker. Just trying to upgrade my wife’s bike to internal battery and 11 speed from an older 6770 setup like I did on mine about 2 years ago. Unfortunately firmwares had progressed since 2 years ago so it did not work. I ended up having to downgrade shifters and battery to get it to work. Unfortunately many older Etube versions you link to here are not valid links. I have a copy of 2.11.0 and downloaded 2.2.3. I think this would work with the two downloadable versions. I installed 2.2.3 and made a copy of “C:\ProgramData\E-tube Project\FW” which has all the firmwares packaged in that version of etube. I then installed the later version (2.11.0, but will probably work with the latest version). Then copy all the firmwares from the the 2.2.3 version back to the same location “C:\ProgramData\E-tube Project\FW”. Now the trick is to find the firmware you want to downgrade (pretty easy from the name and version in the file name), and then rename it to the same name as the latest version, but increment the last version digit by one. 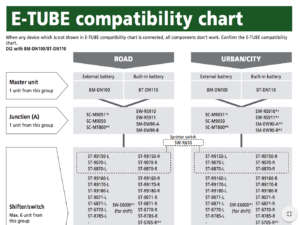 Then connect with etube (without internet connection) and it will identify that a firmware upgrade is available for that component and allow you to do the firmware upgrade. Do the upgrade and exit etube and then rename the firmware file back to original to prevent issue in future. Etube will then try to upgrade again but just don’t let it do that. I was able to get a bike that did nothing (not even enter adjustment mode) to fully working by reverting the battery and shifters. I am still running latest firmware in derailers and that seems fine. Now I would really like to find a copy of Etube 2.5.2. 2.2.3 is pre 6870 I believe so will not connect to my bike. I would like to load the latest firmwares to all my components to make them 2.5.2 level. Has anyone got a copy I can get from somewhere? Did you know this hack was possible? Well mine is charging just fine. I might have an older BCR2 (got it about 2 years ago). I never really upgrade anything unless I have a reason to (and typically use Etube with the internet disconnected). I also note that the BCR2 firmwares are in the location C:\ProgramData\E-tube Project\FW and I have an older one from 2.2.3. It is quite likely you could downgrade the BCR2 in the same way as the other components, but I have not tried this and have no reason to. Your kit is probably a good option for some. In my case I payed under US$100 for a BTR2 and already had a BCR2 and was able to get it working with an hour or so of hacking etube. 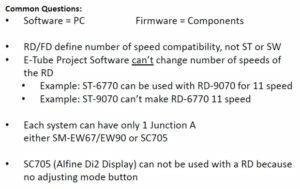 Note that this hack will also be of use to those wanting to run mixed 10/11 speed setups as they can buy a new 11 speed part and revert the firmware to enable it to work with their existing 10 speed parts. Someone must have a copy sitting on a PC somewhere. It would be great to have, as with this hack, it would enable people to revert parts manufactured today to the latest version before Etube locked out mixed setups. I found my copy of 2.5.2. The post has been updated with instructions and 2.5.2 download links, but having issues getting the file on the server and assigning correct download permissions. I’ll get it fixed soon. Thanks Carlton. The new additions to the page look good and should help some people out. Unfortunately I cannot get access to the Etube 2.5.2 link. Do I need to register or something to use that link you added to your internal uploads section? I just get redirected to “Oops not found”. Just noting that the link you provided to Etube 2.5.2 does not seem to work for me. Would be great to get a copy if you have it sitting on your server, but I cannot get to it at the moment. but have you tried to charge the battery? I just connected it up for charging and it is charging fine. Have you done this before and had issues with charging? In my case I have my bike I did 2 years ago and my wifes bike this last weekend. Both were originally 6770. On both I upgraded the battery and derailers, but not the shifters or junction. With the old EW67 junction there is no place to plug in the BCR2 charger, so I made a BCR2 to DI2 connector adapter from a spare DI2 cable I chopped up. Using that I either connect to a spare port on the shifter, or I use another spare cable and a BB junction to connect in line at the EW67 junction connector (this is easier than pulling back the hoods). Using this arrangement I am able to charge the batteries in both and also do any programming I need to do. Note however that late etube software says my setup is unsupported and does not let me do anything. If I want to do programming I have to disconnect the internal battery and connect a spare external battery I have to turn into a supported setup and then I can change settings etc. This takes about 30 seconds as I just pull the BB junction out through the bottom and make the necessary connection changes to connect it to my old BTR1. When I want to program the BTR2 itself, I just connect to the BTR2 by itself (no other components) and the Etube software will allow me to do firmware changes to it. For me it is worth keeping an older BTR2 handy so I can make my setup “recognised” to do anything I want to do. Having said that, I never use etube except then changing the Di2 setup on a bike. I have no reason to connect to it unless it is not working, so these bikes will probably never connect to Etube again until the next time I change something on the setup. Looking to put 6870 on my cross bike but want to be able to swap to an Ultegra road compact crankset during the summer. Is this an easy thing to do? Assuming I just need to raise/lower the FD. Would getting a GS RD help with the chain length? You said “Nothing from the first generation (5-conductor) Dura-Ace Di2 7970 system is compatible with any other system. It was replaced by the (2-conductor) E-tube systems. 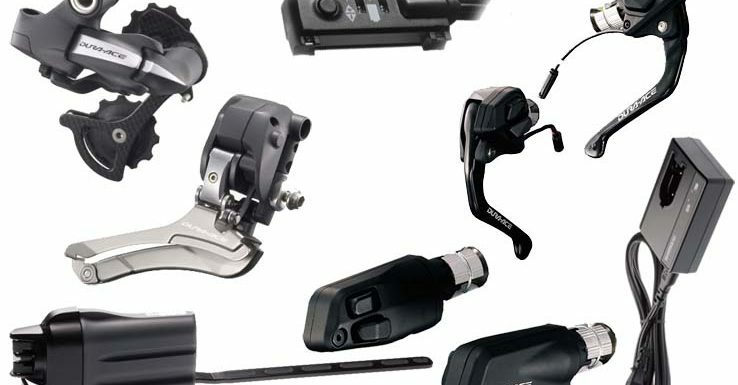 No parts are interoperable between them.” I have a tt bike with tt shifters. Do I also have to buy new ones? 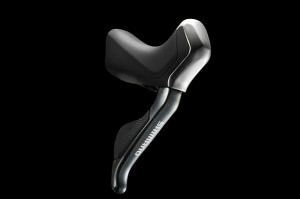 None of the Di2 7970 10 speed including shifters is comparable with the new e tube Di2. Seems the comments on this article are all fairly old now so not sure if anyone is listening to answer my question. But hey, here goes. 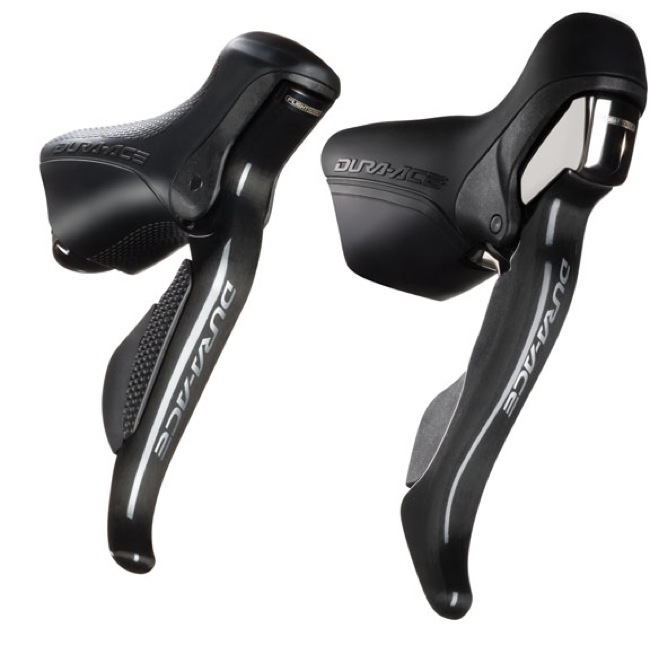 I’ve got Di2 Ultegra but my shifters are the cyclocross Di2 shifters and not Ultegra. I just bought the SW-R600 remote satellite shifter assuming it would work as I thought I had Ultegra brakes. But gutted to discover they’re lower spec and incompatible. Amazing. Thanks for your reply. Please excuse my ignorance but how would I wire it in? Would I just remove the plug going into the 3 port from the rear derailleur, put it in the JC41 then run a 150mm e-tube to the 3 port? Then just plug the satellite remote into one of the spare ports? I also imagine the JC41 is for internal use so the ports won’t come with covers? And should I just be taped to the 3 port to keep it neatly tucked away? Sorry for the questions. Just want to make the right decision. It might be £30ish for the JC41 and extra wire with a bit of work and maybe a messier solution and £60 for the 5 port that will just plug and play and keep it all neat and tidy. Glad to help. I wouldn’t worry too much about water the connectors are quite water proof. If you had an open port it would likely still be ok but you could just use some sugru or silicon. 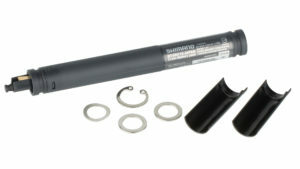 Whats the size of the SM-EW90A compared to the SM-EW90B? I have the SM-EW90B, and it does not fit in the tubes of my tri bar. Does someone have the dimensions? Maybe the SM-EW90A will fit. They are the same size. You can place the A junction anywhere… the shifters do not need to plug into the A junction directally. You can use a JC41 up front and put the a junction under the seat or anywhere you want, it only need to have one wire going into it. i have two jc41 in my bar. 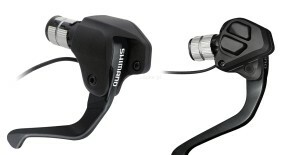 i want to hide the junction a in my bar, cause i dont have a di2 compatible frame. but i can go from RD and FD to the bar inside the frame. so i want to put all the rest into the bar. I’ve been under the impression they’re of different size. 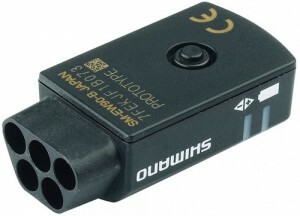 Have a 3-port (90A), just measured it, W:21.9, H:17.2, L:44.3 mm, +-0.1 mm probably. 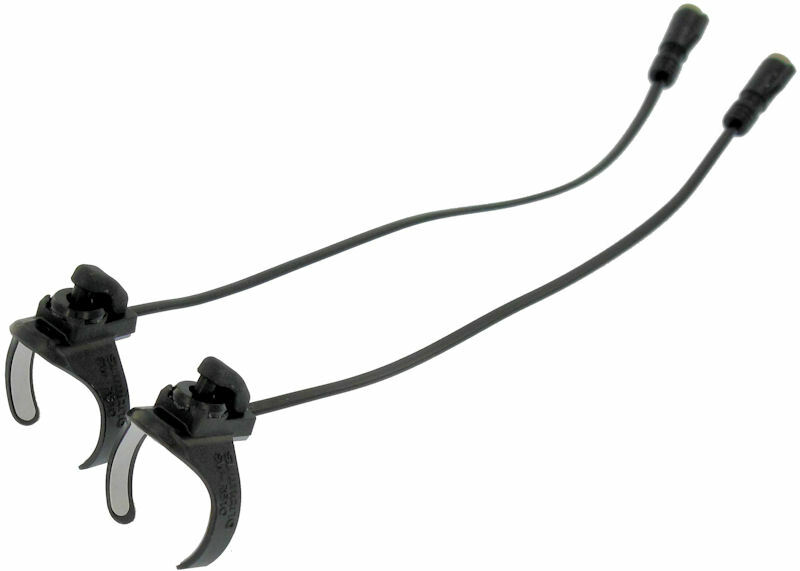 Length without cables attached. What about the 90B? 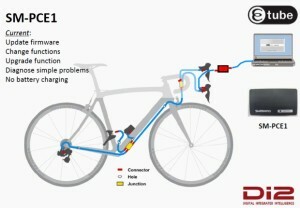 Would the DI2 electronic shifting work for this application? Because of the long cables it very hard to keep it running, or will it have the same maintenance? 1. Anyone use RB1K frame already? how I can install internal battery in the seatpost? RB1K have integrated seatpost. Any suggestion? 2. For information display. 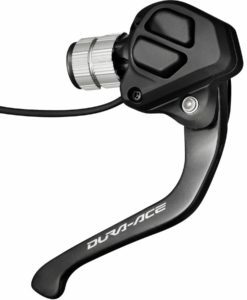 Can Dura Ace 9070 use SC-M9050 XTR? 3. if Yes, which better using SM-EWW01 ANT+Garmin/Mio/… or CS-M9050 XTR for information about gear position and battery capacity. Just upgraded to the R-785 hydraulic setup and love the braking but really miss the convenience of having sprinter buttons from my old 6870 set. Any way you can think of to make a sprinter type button work? I’m looking for some photos or other information of the internals of the Di2 ‘A’ junction. I’m interested in keeping it completely internal/hidden, and bringing the button and LED’s to an external location on the bike. I’ve seen a few project bikes like this, but have not seen the detail on how they did it. I’m assuming it will take some pretty delicate soldering to a very small circuit in order to do so. If anyone has seen details or info, please point in the correct direction. 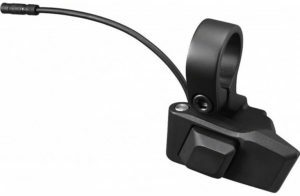 Worthy addition to the rear derailleur trim section; If you’re using an SM-EWW01 and have a Garmin or other head unit capable of displaying Di2 information (Edge 1000 etc), the display automatically switch into derailleur trim display when you activate that mode by press the button at the junction (A) of the SM-EW67-A-E. It will give you the trim position in either + or – 12 positions and you then simply need to take note which position suits which wheel/sprocket/trainer, and trim to that level each time you change. This removes the guesswork and makes changing from wheel to trainer simple. Hope this helps some people as it does when I switch between wheel and my Wahoo Kickr trainer. 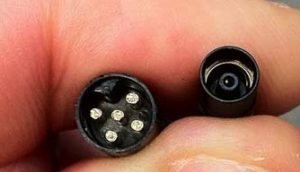 “SM-EW67-A-E Ultegra 3-Cable Junction” Will this junction work with a 11 speed setup running an external battery?? I have just completed an 11 speed 6870 upgrade on a 10 speed 6770 system and all I changed were the front/rear derailleurs, cassette and chain. Didnt replace the EW67A or the levers and everything working fine. I updated the firmware on the Etube software program which you will have to do to get all units talking to each other. 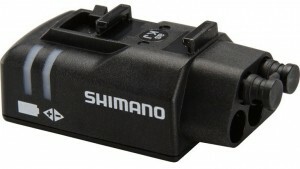 You can also upgrade to a Shimano internal battery with a little hacking. I am running two bikes in my family with that setup and internal battery. It requires making an adapter to use the BCR2 charger to charge while using the EW67A junction and it requires downgrading of component firmware to pre version 2.5.2. When I plug my new di2 shifters in they do not work. I have access to ultegra shifters and when plugged in everything works fine. What am I missing? Bryan, Assuming everything else is as it should be, and as this excellent site has advised to many others, FIRSTLY, you must UPDATE YOUR FIRMWARE to get the system to ‘talk’ to your new STIs. If you need guidance on HOW TO UPDATE YOUR FIRMWARE simply read the threads here. Enjoy your Di2 and ride safe. 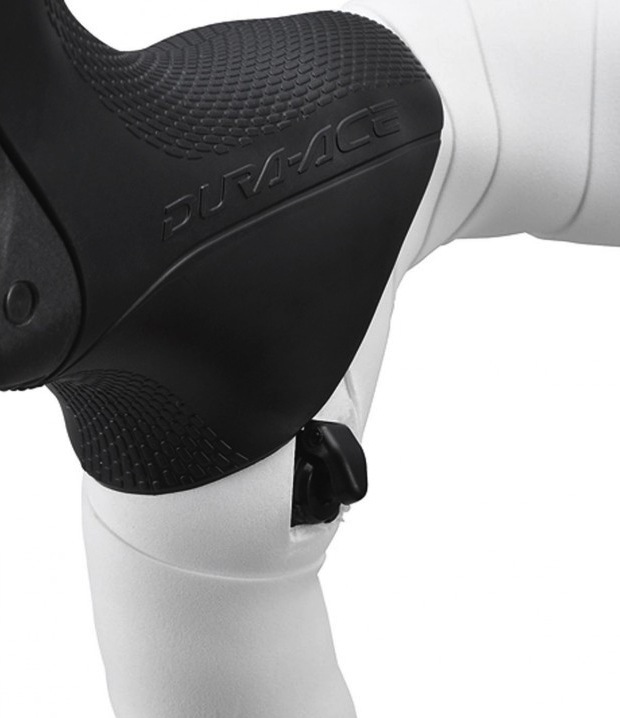 I have dura ace di2 9070. When installing everything is wired up and nothing works. After much trouble shooting I have verified the problem is in the shifters. I have a bike with ultegra shifters and when plugged in everything works. 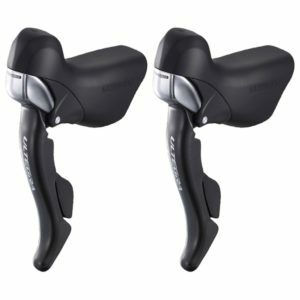 Shimano sent me new shifters and they didn’t work. They had the same issue. Any ideas about my problem? already answered. sorry for repost. 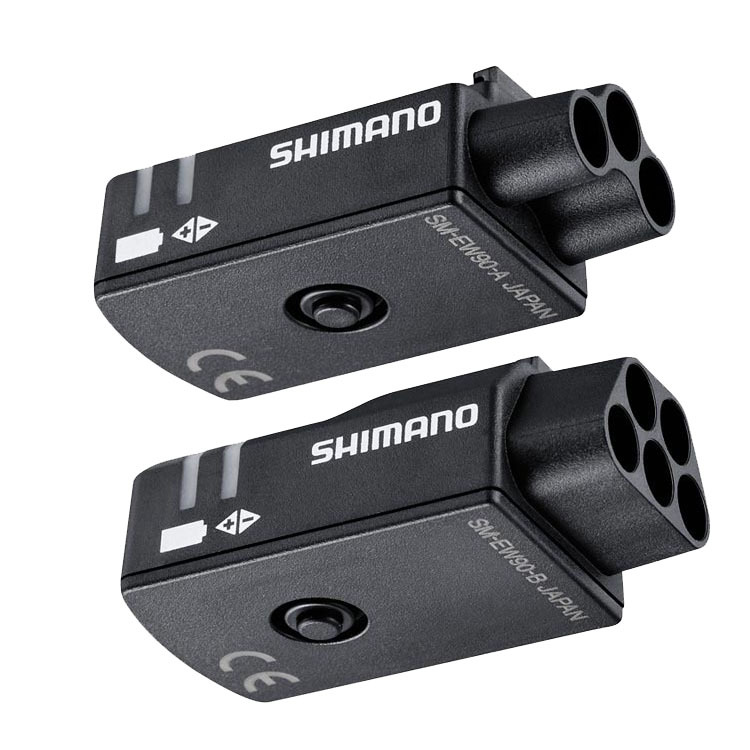 Would you be able to run a DI2 setup without the SM-EW90 junction. I would serial connect the shifters with an etube cable and take another etube cable from 1 shifter to the internal junction and then connect the battery, FD and RD as usual. When I need to charge I would connect the SM-EW90 via one shifter and then disconnect again when charged. My chain falls off large FD Ring so I am fine tuning di2 just about every 3rd/4th ride. Close examination of large ring revealed: No two teeth are alike. Most teeth are unequal in length, pointed on top or with sides that appear filed at random angles. Question: What could cause this early failure and what effect, if any, is likely on chain and rear 11sp sprockets? That’s the same front ring I have, and I’ve never dropped a chain. Your front derailleur is not adjusted properly. It’s not the electronic trim that’s off, it’s the mechanical adjustments. The derailleur mounting height and/ or adjustment screws need to be corrected. The teeth on the ring or not worn. They’re supposed to be that way to allow proper pick up from the small ring. You will see that the smaller teeth correspond to pick up regions on the inside of the larger ring. There are links to the dealer installation manuals in the article. You can try the adjustments yourself if you don’t think your shop is capable, but they really should fix that for you. Having raced Velodrome, Road & Track (fixed wheel and Sturmey Archer) during college days half-century ago on the other side of the Planet, I had thought I knew everything about bikes 🙂 . Thank you! Oh, btw, the shop confirmed your comment…….verbatim. so i mean the chain runs rough touching the fd in this rear sprockets, i thought meant to run with no rubbing as micro shift trimming would enable that? 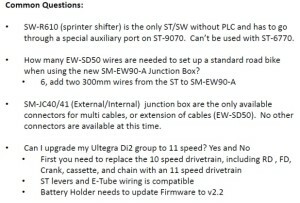 Can the ultegra di2 firmware (external battery) be updated using the bmr2 through the ew90B? 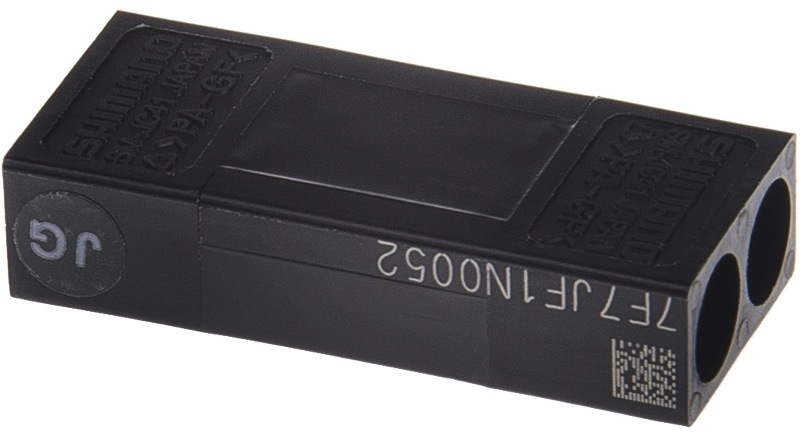 Would the battery be safe? Need to update in order to make a d-fly work. Or, do I need the much more expensive pce1? Yes the BCR2 will update the system, including the battery mount, the battery itself does not get updated. 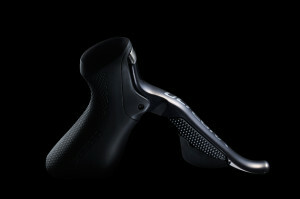 Thanks for taking the time and efforts to simply the Di2 system. 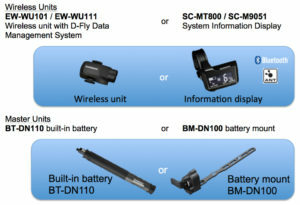 When will the new internal battery BT-DN110 and the M800 display will be available for sale?? How is the BT-DN110 charged, does it use the SM-BCE2 charger or a new charger? Do not try to setup the drivetrain to shift in a combination you should not be riding in. If this is the only issue and all else is setup good and you get rubing in that combo, also be sure the chain is not too short. thx, ok thought di2 would run ultra smooth due to micro shifting in all 22 gears? i don’t ride it cross chained but setting it up on the stand just presumed it would be spot on in every combo??? Sometimes you can get everything dialed but chainline does very from bike to bike, and a slight difference in chainline can effect extreme combos should not be a concern… also focus on how the bike shifts on the road, not so much on the stand. my rear derailleur stopped shifting. I checked battery and it shows 8.5 volts. when I press the button on the junction box by the handlebars it shows red. The front derailleur works fine. I checked the plug connection at the shifter and it is OK. I am guessing that it might have unplugged at the junction inside the frame by the crankset. My battery is mounted at the bottom of the crank. Is this a probable culprit and, if so, do I need to remove the crank to access this connector. thanks for your great write-up! 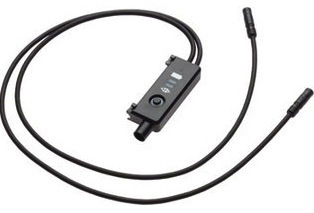 how can I tell which junction box and cable works with DI2 6770. 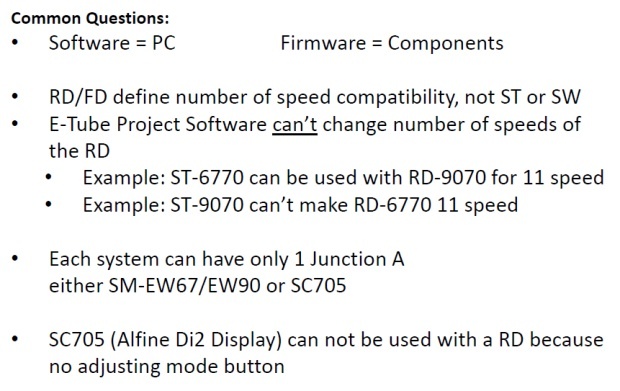 Is the 6770 compatible with the following? I’m having difficulty with using the software to change the controls on my 6870 group. When I connect up it doesn’t like the battery so I tried connecting ONLY the battery to sort the firmware and it still doesn’t like it. I have the SM-BCR2 connected to a 3-way a-junction and then to the battery via the b-junction. When I do this it still says I can’t use that type of battery and asks me to look at update the software but then it says I’m running the most up to date! You can continue with the process either by upgrading to the latest version or removing the unit. Hi James I get the exact same message from e-tube no idea what to do. I still haven’t rectified it. Can anybody offer any help? ?